Tacko Fall listens in during a timeout in the second half. 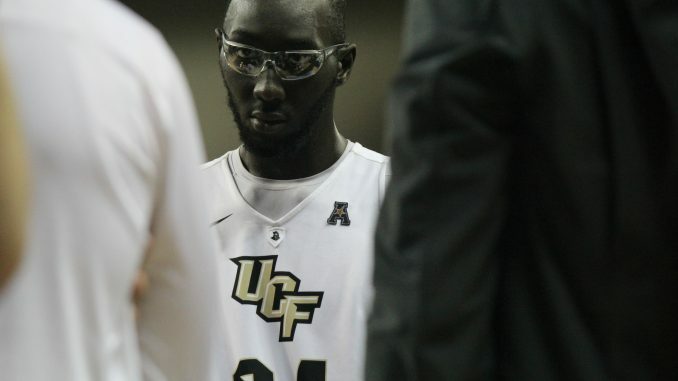 The UCF men’s basketball team will be without junior center Tacko Fall for the remainder of the season, after it was announced that he would undergo surgery to repair a shoulder injury. The announcement comes just days after Fall played 24 minutes against No. 12 Cincinnati. Fall had been battling through the injury all season, but did not miss any time aside from the season opener because of a different injury. So far, this season, Fall has averaged 11.3 points per game, 7.3 rebounds and 1.9 blocks on 77 percent shooting. He was also the anchor of a UCF defense that currently ranks fifth in the nation in opponent’s field goal percentage. In Fall’s absence, fellow junior Chad Brown will most likely step into the starting role after being Fall’s primary backup for a majority of the season. Transfer center Rokas Ulvydas will likely see an increase in minutes as well. This injury adds to the growing list for the team this season. The Knights lost wing Aubrey Dawkins before the season even started to a shoulder injury, as well as guard B.J. Taylor, who just made his return, to a foot injury for eight weeks, and guard Chance McSpadden to an ankle injury, who is still waiting to make his return. The Knights take on the USF Bulls tonight in Tampa, in what will be their first game without Fall.